This documentation will walk you through best practices to receive a timely response, making the best use of both your time and our time. Any relationship — be it a vendor-customer, friend, or family relationship — all depend on clear and effective communication. Receiving precise, timely, and effective support is no different. Please review the following steps before proceeding with your support request, if you are using WordPress please click here for WordPress-specific self-checks. 1. Is Your Hosting Service Up-To-Date? 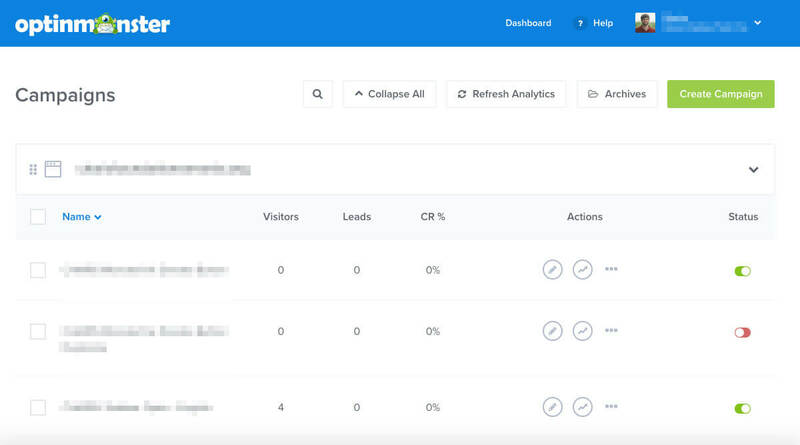 If you are using a platform other than WordPress to power your site, please check that your host meets the minimum required needs of your platform before proceeding. 3. Is Support Still Needed? Log-In to Your Account before sending a support request. 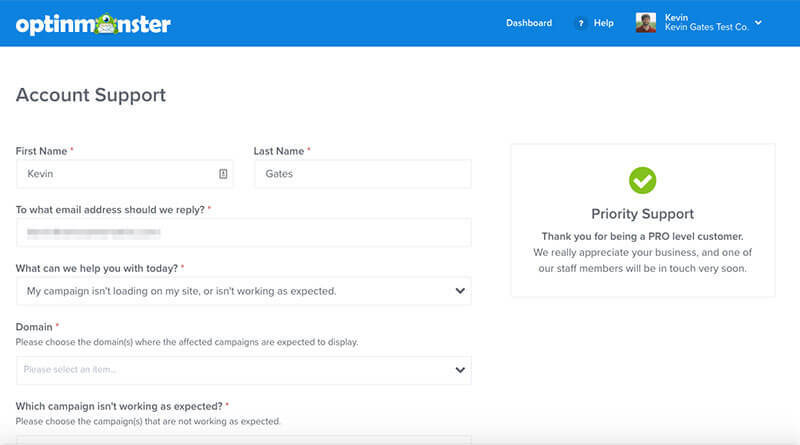 This gives us more information such as your purchase email, which lets us see your campaigns. ALSO, this will label your email with the appropriate priority, which helps us prioritize tickets better. Always log in before you send a support ticket. Be specific (as much as your technical ability allows) as to both the problem and your desired functionality for OptinMonster. Back-end Issue? Please provide temporary admin credentials, including a link to your log-in screen. To proceed, click here to follow our instructions on submitting your support request. The latest WordPress release (as of May, 2018) recommends PHP 7.2 or higher, MySQL 5.6 or higher (OR MariaDB version 10.0 or greater), Apache or nginx, as well as HTTPS support. You can find more about hosting services and requirements here. Sometimes images do not load or there are problems that are caused largely because a hosting service is not working properly or it is not up-to-date with the latest WordPress requirements. Note: If you are a new customer and are having problems loading OptinMonster on your website, checking your hosting service should be your first priority. 3. Is Your OptinMonster Plugin Up-To-Date? We have already created a document talking about installing OptinMonster, so we encourage to check that out and ensure your OptinMonster plugin is actually activated. The next step is very similar, make sure OptinMonster is up-to-date with the latest version and that all your add-ons are both updated and activated. If you need help, check out WordPress’s plugin documentation on managing plugins. 5. Is Support Still Needed? IMPORTANT: Please send us the Debugging PDF. You can find this by going to your WordPress Dashboard → OptinMonster Menu → Support Tab → click Download PDF Report. Attach that PDF when you’re submitting your support inquiry. To send us your support inquiry, follow our instructions below on submitting your support request. 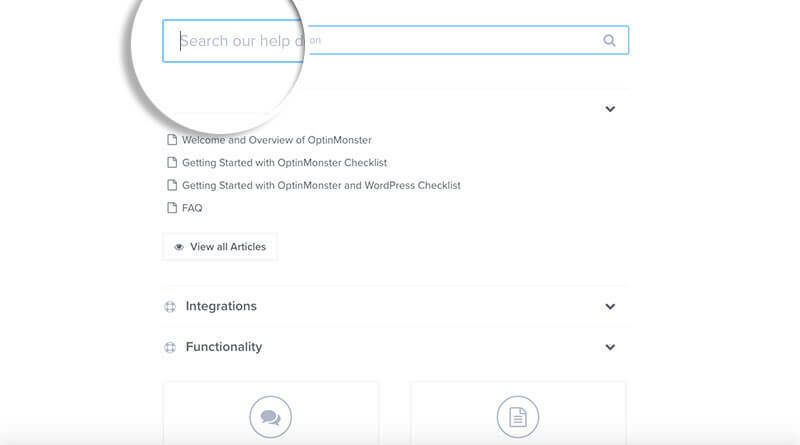 You will have access to email support once you log in to OptinMonster. Log in to your account here at OptinMonster and you will see the dashboard. By clicking the ? Help button, you will have an overlay appear which will give you access to both related documentation and the area where you can submit a support ticket. 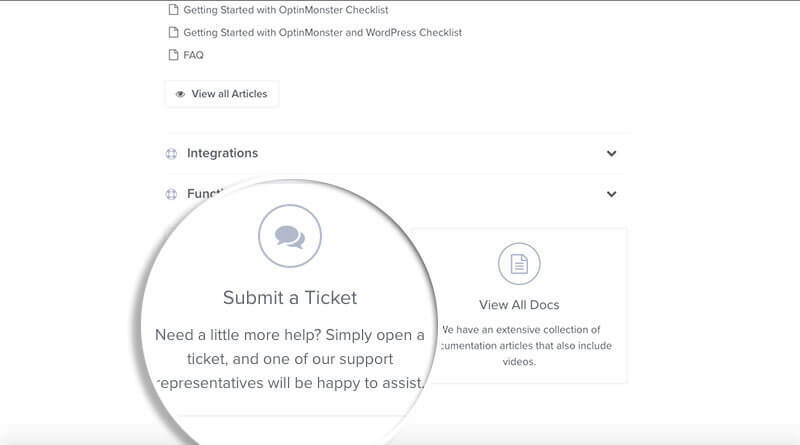 When you click that button, you will be taken to our support page, where you can select your topic, any related campaigns, and the ticket will come straight to our inbox. General Note: Using the support form while you’re logged in will always speed up your reply time compared to submitting a ticket when you’re logged out or when you email directly. WordPress Note: If you are having problems on the Admin side of your WordPress site, you should especially consider providing temporary administrator credentials so that we can more effectively aid in debugging. WordPress Note: Please send us the Debugging PDF. You can find this by going to your WordPress Dashboard → OptinMonster Menu → Support Tab → click Download PDF Report. Attach that PDF when you’re submitting your support inquiry.